Your browser does not appear to be loading scripts! If you have not disabled scripts, they may have been disabled by your system administrator, or not be loaded because you are using an old browser. If you continue to receive this message on your PC, please try to use our website on a tablet/iPad/mobile phone. Please be advised that there is currently a two week lead time for dispatch of this product. The SIGM20 is an automatic controller for eight signals. It sets the signal state automatically according to the state of the trackwork (e.g. points), other signals and block occupancy detectors. It does this automatically, without any other computers involved: so no PC is required to operate the railway. The board can control simple blocks, simple and complex junctions ... automatically. 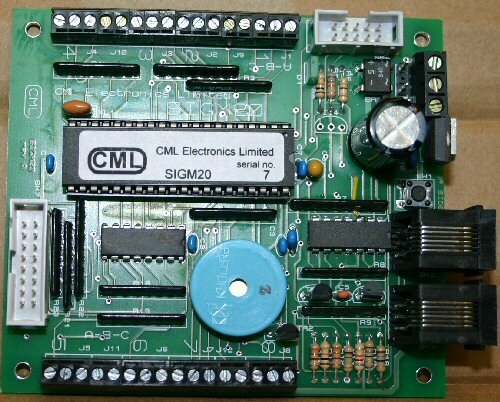 The SIGM20 drives LED signals directly. Via optional adapters it drives incandescent lamp signals or semaphore signals controlled by Tortoise point motors. The behaviour for each signal is programmed: thereafter it operates automatically without needing a PC to be present on the layout. Two more signals can be driven by an optional self assembly add-on board. LED signals: these can be 2, 3 or 4 aspect, or "searchlight" type. Simulation of "soft" lighting & dimming of lights: brightness ramps up or down over approximately half a second for more realistic looking signal lamps. controlling a straightforward block (with one "ahead" route). controlling a diverging junction (where the route depends on the state of points on the section ahead). All the behaviour is determined by LocoNet & DCC messages. In common with many DCC devices, the function performed by the DTM30 is fully defined by the settings of a number of System Variables (SVs). The functions can also be defined in the “normal” manner using a CV programmer. The settings define the following behaviour of the board. In most cases users will not need to program these settings directly. Operating semaphore signals from the SIGM20 using a Tortoise™ and RLY2 Relay Board. Switching power from the SIGM20 using an RLY2 Relay Board. As the SIGM20 is designed to operate low voltage LED’s, devices with higher power consumption require a relay to switch power from the SIGM20. For more information please hover over the relevant payment method. Sig-naTrak® is the registered trademark of GFB Designs. All prices are inclusive of VAT at 20% for EU Customers. VAT Registration Number: GB 155 3856 89. © 2019 Sig-naTrak®, All rights reserved. Website Developed by GM Publicity for GFB Designs.Website Screenshots by PagePeeker.